Re-create the tilt-shift effects by using your PC – no tilt-shift lens required! Make stunning dioramas by using computer-generated tilt-shift effect. 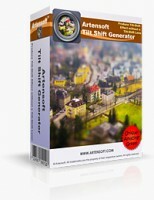 Artensoft Tilt Shift Generator helps you reproduce the appearance of a miniature scale model in post processing without restricting yourself to a certain angle at the time of shooting – and without investing in expensive tilt-shift glass. Tilt-Shift Generator produces convincing, natural-looking miniatures at a small fraction of the price of a real tilt-shift lens. And the best part is it works just as good as or better than glass-and-metal tilt-shift lenses.